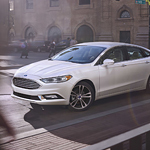 The new 2018 Ford Fusion offers drivers the greatest technology features, including the ability to have your driving monitored, remotely start the vehicle, navigate the surroundings or safely make phone calls without taking your hands off the wheel. Stop at Sheehy Ford of Warrenton and check out the many technology features the Ford Fusion has to offer. The Ford Fusion is offered in several energy-efficient models. When using the Energi plug-in hybrid, you can choose between the electric engine, gas engine or a little bit of both. This vehicle offers the best in its class in fuel economy. The SmartGauge® provides a customizable touchscreen monitor that lets you monitor your driving and get the best possible efficiency. Before you make your final decision on your next vehicle, you may want to check out the Ford Fusion and take it out for a spin. Visit our showroom today and check out the many models.